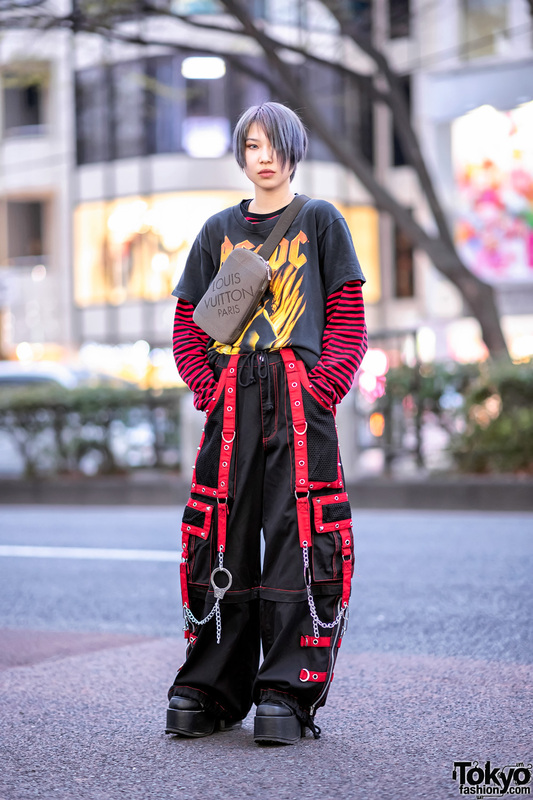 In Harajuku, we spotted Joz, a green-haired 19-year-old student whose streetwear style easily caught our attention on the street. Joz stepped out on the Harajuku street wearing a black sleeveless shirt from Stussy, which she tucked into a black bandage miniskirt from Bershka, and paired with platform sandals from Evris. She accentuated her look with items from Faith Tokyo such as large silver hoop earrings, a rhinestone necklace layered with a pendant necklace, and oversized sunglasses. A clear crossbody bag from Nana-Nana finished off her street style. For her social media updates, check out Joz on Twitter and Instagram.